The senior national team, the Black Stars, would miss the services of combative midfielder Michael Essien and striker Baffour Gyan in the next World Cup qualifier against the Democratic Republic of Congo slated for Kinshasa in March. The two Ghanaian internationals attracted two yellow cards in their previous games and are therefore not eligible to feature in accordance with FIFA's regulations. The Stars travel to Kinshasa as guests of DR Congo for the crucial away tie on March 27 hoping to register a win to topple group leaders South Africa who are a point richer than Ghana. Neighbours Burkina Faso, Uganda and Cape Verde complete the list in the group. Coach Ratomir Dujkovic who leads the Stars in their first major game since assuming duty last December is already mourning the absence of the two who were key ingredients in the last five matches. He told the GNA Sports: "I know how important these two players are to the team and wish they would be present to help our course in Kinshasa". The Serbian who is yearning for a win in the Congo game said however, "We would have less problem in replacing them since we have other options". "For instance we have the Taylors, Matthew Amoah's, Tiero's and many more to rely on during the Congo game". 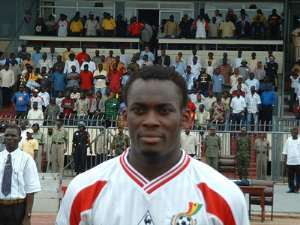 The Lyon Star Essien and Russian-based Baffour would however, be eligible for the Stars' next game against Uganda at home.